Ibsen’s 1886 play Rosmersholm will be revived at London’s Duke of York’s Theatre in the West End in April, starring Tom Burke and Hayley Atwell. The play is considered to be one of Ibsen’s masterworks, and is set on the eve of a major election. It sees Rebecca West – considered one of Ibsen’s feminist heroines – try to get John Rosmer to accept a free-thinking way of life. But Rosmer is a man haunted by history, torn between his hope for the future and the ghosts of his past. And at the centre of it all is Rosmersholm, the grand house a prestigious and powerful family. Hayley Atwell and Tom Burke star as Rebecca West and John Rosmer in this new adaptation directed by Ian Rickson. Atwell’s theatre credits include A View From the Bridge (Duke of York’s), and Dry Powder (Hampstead Theatre). She can also be seen in the Marvel series Agent Carter, as the titular role. Burke most recently starred in the tour of Don Carlos, and has lead roles in the television series’ The Musketeers and War & Peace. Joining them are Giles Terera (Hamilton), Peter Wight (Hamlet), Lucy Briers (The Seagull), and Jake Fairbrother (Lady From the Sea). 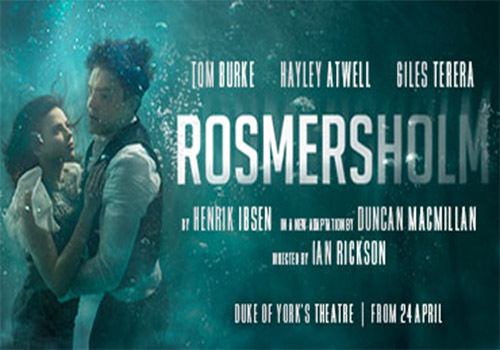 Rosmersholm is directed by Ian Rickson (Betrayal, Jerusalem) and adapted by Duncan Macmillan (1984). Design is by Rae Smith (Barbershop Chronicles), lighting by Neil Austin (Company), music by Stephen Warbeck, and sound by Gregory Clarke. Casting is by Amy Ball CDG. Rosmersholm runs from 24 April – 20 July, with an official opening night on 2nd of May. The age recommendation for Rosmersholm has yet to be announced.